Many pet owners love to take their dogs hiking. If you haven’t tried yet, here are six of the best reasons to hit the trail with your pup this weekend! 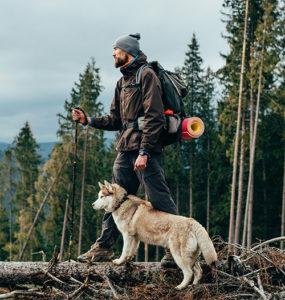 Walks are great exercise for your pup, of course, but hiking offers a different experience that will stretch different muscles (for you and your pet), especially if you have access to an area with elevation or rugged terrain. If you have a high-energy dog, hikes are a great way to ensure your pup gets necessary exercise and expends appropriate amounts of energy. Unlike some other active sports, hiking requires no expensive equipment. You just need access to a good hiking area—something freely available in most parts of the country at state parks or recreation areas—some comfortable shoes, and water sources for you and your pet. Much as with human beings, when you and your dog share circumstances where you are challenged, your relationship deepens. Hiking together helps you bond with your pup through a shared experience of fun and physical exertion, leading to a greater understanding of one another and a closer emotional tie. If you hope to train your dog to accompany you on more extreme adventures—camping or canoeing, for instance—a simple hike is a great way to begin to get your pup used to rugged outdoor activities. And even if you don’t intend to go any further than hiking, getting your pup used to the great outdoors helps build confidence and obedience for any unexpected or active situation. Although in most areas you have little to fear when hiking—either from wild animals or human threats—having your dog with you still provides reassurance in case something unusual were to happen. Even if your pup isn’t fierce by personality or breed, wildlife like bears and mountain lions shy away from encountering dogs, and they can scare off human dangers as well. As Outside Magazine points out, in many areas animal control departments train wildlife to fear dogs, so you should definitely feel safer with your pup by your side. All in all, having your dog along can be a great idea on a hike. Of course, you will want to make sure that your friend is protected from unpleasant bites while you’re out in the wild. TropiClean’s Natural Flea & Tick line includes shampoos and sprays to ensure your pet will stay pest-free even after spending time on the trail. Our shampoo, AfterBath Treatment, and sprays kill Fleas & Ticks by contact to keep your pup comfortable and healthy. Get more information on TropiClean’s Natural Flea & Tick Products, and enjoy your hike!